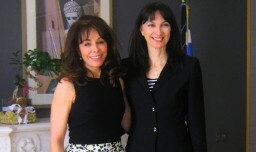 Actions for the promotion of Greek destinations and sustainable tourism through the European EDEN (European Destinations of Excellence) project were discussed by Greece’s Alternate Tourism Minister Elena Kountoura and Thessaloniki’s Regional Vice Governor Voula Patoulidou, in a meeting held in Athens last Friday. The goal of the program is to promote new, non-traditional tourist destinations according to the principles of sustainable development. Since 2007, they have awarded six Greek destinations: Florina, Grevena, Lesvos, Serres, Delphi and Marathon. Patoulidou has been selected as a national Ambassador to the EDEN project to promote the awarded Greek destinations both in Greece and abroad and to support the idea of “a healthy, eco-friendly and sustainable tourism lifestyle”.